The test takes approximately 3 hours and consists of four parts: English (45 minutes), Mathematics (60 minutes), Reading (35 minutes) and Science Reasoning (35 minutes). There is usually a 10 minute break after the Mathematics test. Scores are reported to the admissions office within 2 business days of testing. 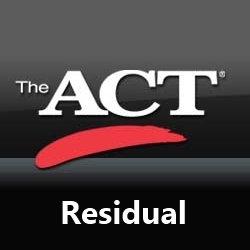 Click here to register for a Residual ACT testing date. Payment via credit card of $55 will be required during registration. Remember to contact the DC Admissions office to inform them of your chosen test date. Please remember to bring your photo ID, #2 pencil, and a scientific calculator. $55 non-refundable test fee payable by credit card is due at the time of registration. Dress in layers to ensure you are ready for any room temperature. Must wait 60 days to retake the same test. Test is only valid for admission purposes at Defiance College. The score cannot be sent to another institution.